>>> In a time when the act of reading is changing significantly, the physical book as a mechanism for reading, is being brought into question. My practice is concerned with the future and reality of reading, the book as reading machine; and is bound up with an (imagined) escape from the page. 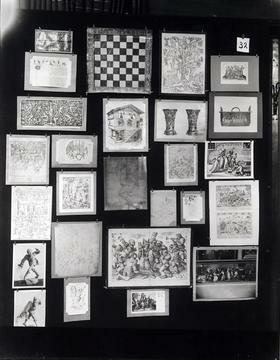 Aby Warburg was an art historian, but he was also interested in how historians researched art and so set up his own library; this was organised in a very unique way, not by subject or alphabetically but by affinities that only he was able to explain in any detail. His big unfinished project was the Mnemosyne Atlas which was an extension of his strange and different library classification scheme. As you can see from the images below he created panels covered in black cloth to which he pinned photographs and postcards. A visual research board where certain paintings related to each other; where images had relationships with each other that they might not otherwise have had. These boards were always only meant to be the start of the project, eventually he wanted to create some kind of book to explain his theories. 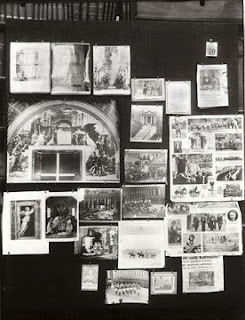 This never happened as he died and then the boards were lost when his colleagues were fleeing the Nazi's; as with Kurt Schwitters' lifelong project the Merzbau, only the photographs remain. Your project is so interesting... I'm fascinated! thanks Sara; its getting a bit out of control but its good too, im so excited about it all the time, plus its the start of something big in my practice so I am going with it! will be a very useful start to my MA! You are giving us a wide open window into the scholarly world of the researcher-historian-artist. As a member of the BAO group I feel ever so fortunate to be among the members receiving one of these works in the future! ahhh abigail you're a girl after my own heart! I haven't heard of the Mnemosyne Atlas but you've made my day with this post! This is a fascinating post and I feel privileged to be following your processes as your BAO 'book' takes shape. I hadn't heard of the Mnemosyne Atlas either but I'll be going to explore. that is meant to say "there is an article in The Blue NOtebook" !